The Muslim doctor should be careful of what is transmitted in the medical journals (or textbooks) and he should not accept everything transmitted in them without ascertaining its correctness, for indeed knowledge is established either through a trustworthy transmission or an unquestionable view point. 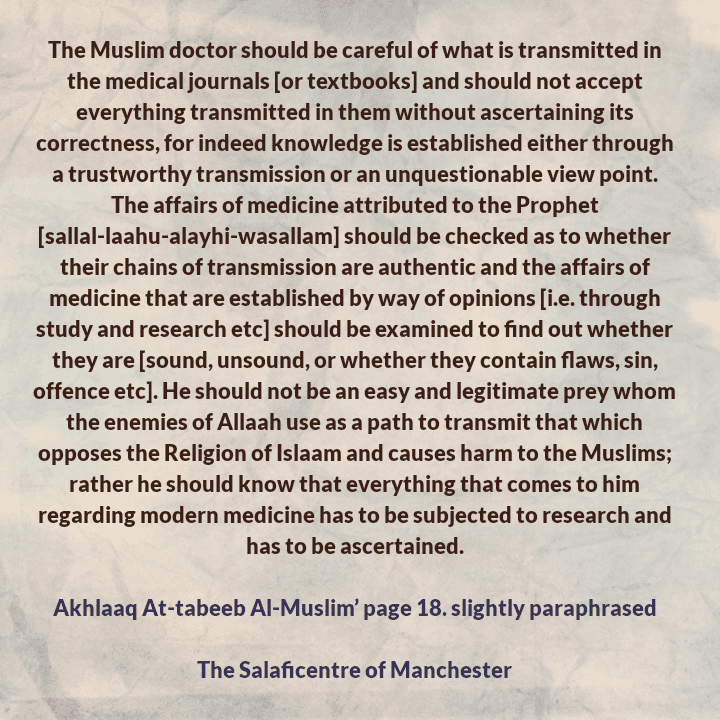 The affairs of medicine attributed to the Prophet (sallal-laahu-alayhi-wasallam) should be checked as to whether their chains of transmission are authentic, and the affairs of medicine that are established by way of opinions [i.e. through study and research etc] should be examined to find out whether they are [sound, unsound, or whether they contain flaws, sin, offence etc]. He should not be an easy and legitimate prey whom the enemies of Allaah use as a path to transmit that which opposes the Religion of Islaam and causes harm to the Muslims; rather he should know that everything that comes to him regarding modern medicine has to be subjected to research and has to be ascertained.